QUANDO SE PERCEBE UM INDIVÍDUO DIFERENCIADO E ANALIZA SUA ÁRVORE GENEALÓGICA, DEPARA-SE COM EL SHADY ZORRERO X APOLLO VM X HOLLAND EASE. Peso: 286 - Altura: 1,36. EASE N FIRST: AA-84, por Holland Ease. Importada com 1 2º e 1 3º em 10 atuações nos EUA, US$ 2,409 em prêmios. 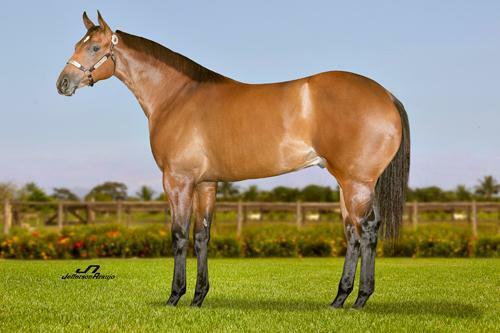 Irmã de JAZZY CORONA AAAT-101 (4 vitórias, $107,513, 1º Speedhorse Gold and Silver Cup Derby-G3). Mãe de : * (06) Easezoom AAAT-101, por Shazoom. 3 vitórias, US$ 42,567. * (07) Eyesa Easy Girl, por Mr Eye Opener. Não correu. * (08) A Blaze Of Zoom AAAT-101, por Shazoom. 1 vitória, US$ 38,423 * (12) Ease N Tres RCH, F, por Tres seis. SI 92, by Easily Smashed. 5 wins at 2 and 3, $21,364. Sister to WINE SMASHED SI 95. Dam of 11 foals, all ROM, incl.? JAZZY CORONA SI 101 (f. by Corona Cartel). Stakes winner, above. $84,160, Speedhorse Gold & Silver Cup Futurity [R] [G2]. 2nd Canterbury Park Express S., finalist Sooner State S. [R] [G3]. 2nd Sooner State S. [R] [G3], Woodlands Champ. ETR 300y. Fair Meadows Belles S. [G3]. $11,678, finalist in the Oklahoma Futurity [G2]. Ease N First SI 84 (f. by Holland Ease). Placed to 3. Dam of? Easezoom SI 92. 3 wins to 4, 2010, $41,516. AAA - 99. Ganhador clássico de $ 326,060 Campeão Mundial, 14 vitórias. Produtor de Campeão Mundial, produtor de 41 ganhadores em Tambor, 810 ROM, 63 Vencedores Clássicos. Produtor de Ganhadores de $9,287,339.